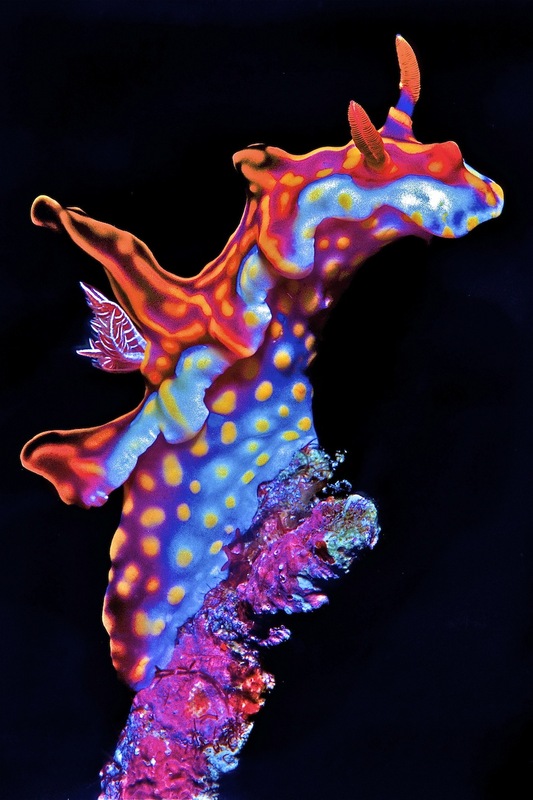 Above: Approximately 2,300 species of nudibranchs are known to science, this species is called “Magnifica”. Nudibranchs are basically snails without shells. For protection, they use chemical warfare! They eat poisonous things to make themselves more poisonous to predators. They’re all carnivores, and some are cannibals. They’re good examples of the saying ‘beauty’s only skin deep’! Nudibranchs are part of the mollusc family even though they have no shell. They come in every imaginable shape and colour, and occur in oceans worldwide from the tropics to the Southern Ocean. Approximately 2,300 species of nudibranchs are known to science, with the name derived from Latin and Greek words meaning ‘naked gill’. This is appropriate as many species breathe through a gill on their back which is shaped like a rosette. Others have toxic appendages or ‘cerata’ on their backs, to deter predation. These commonly-named sea slugs are masters of chemical defence, compensating for their lack of shell protection in a number of ways that are pure science fiction. Nudibranchs are carnivorous, some are cannibals, and they enjoy a varied diet including stinging hydroids, anemones and sponges. Rather than digest the nematocysts (poison cells) of their meal, Nudibranchs can transfer it from the gut to their skin, increasing their own toxicity.